Just back from Mallorca and just in case you haven't heard (unlikely!) 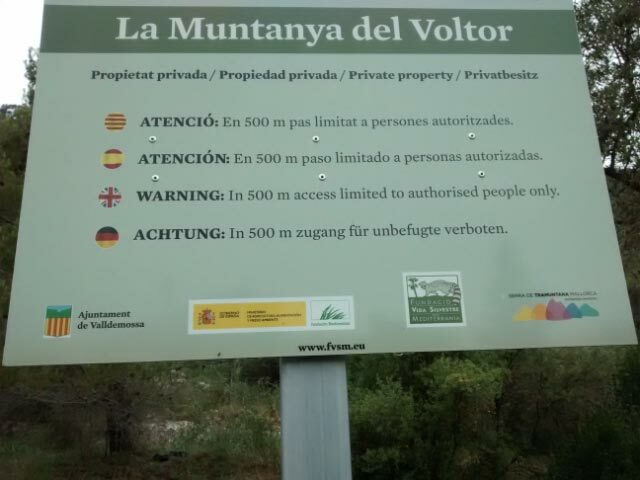 there are restrictions in place around Valldemossa. No issues at all about stopping access just a need to pre-plan for some routes as these now require a permit. It is all very commendable in terms of conservation and importantly the restricted areas are being actively patrolled so it would be daft to go without a free permit. The signage is generally clear in explaining restricted areas but can be a bit confusing in places. This is especially so just near the start (junction of Carrer Oliveres and Ametlers) where a sign indicates that the route ahead, Oliveres, appears closed and an arrow points to the right along Ametlers. It needs to be read carefully! You do not go right. Pic1 is the sign I referred to-with the little black spot (easily missed) indicating that that the control is ahead. It is at that point the public path goes left and not at the road junction where it is placed. The control is shown in pic3 and is at the junction where your 3b route splits to the right of the 'GR221'. Pic2 just shows another sign atop a 2m post on the left hand side of the Carrer Oliveres and Ametlers junction-we missed it on the way out as it was hidden by a parked mini-bus! 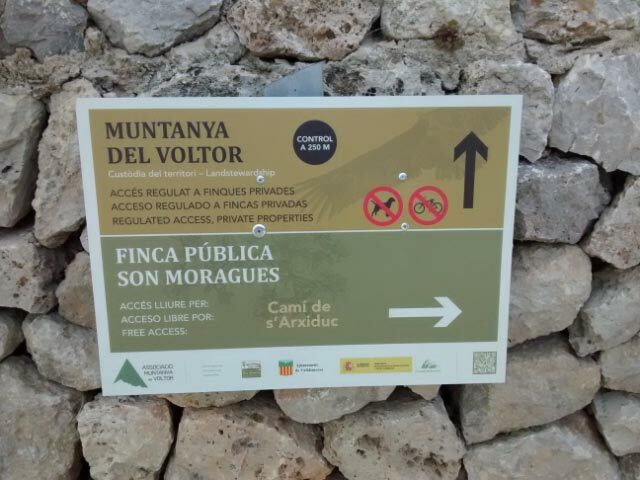 As you will have spotted from the http://muntanyadelvoltor.com map the 221 is now being rerouted to go up towards Refugi de Son Moragues. We did have a chat with one of the 'trail patrol' who said that discussions were taking place about possible extension of the permit required area to include the path around Corral des Bous so I would expect further limits in the next year. None of this stops access but simply introduces a management strategy to get a grip on the erosion etc and there is no charge for permits so all good stuff really. I sent and e-mail to request permission to pass through the restricted area. I was surprised to receive a positive reply within hours. I was informed my name was down for the two days I requested but did not receive any kind of document to present on arrival. 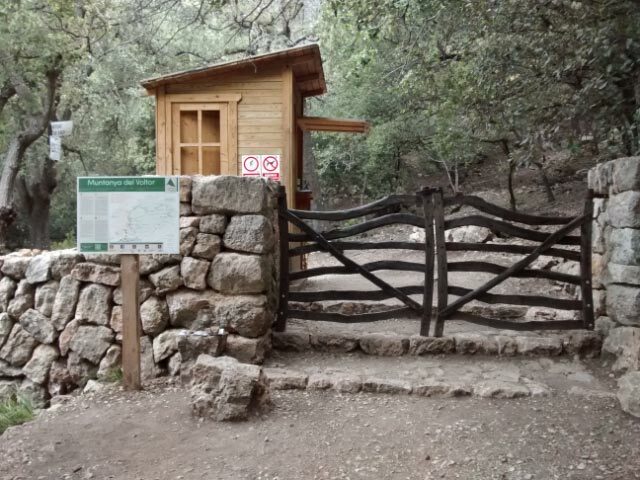 I noted the kiosk near the start of trail 49 (Valdemossa to Deia) has been moved much further up the trail but was surprised to find it unmanned and locked. Last year it was manned by a person with good English handing out sketch maps. Near the inside edge of the restricted area I saw a man with a clipboard inspecting some devices hanging from trees and taking notes. It turned out to be the person who replied to my e-mail. Within the restricted area I did not see anyone. In fact I met very few people along the whole trail to Deia, unlike last year when the mountain seemed very crowded. Overall, I got the impression that they are not taking the restrictions too seriously. No permission pass document provided, an un-manned kiosk and not challenged by the guy with the clipboard. It was I who approached him. 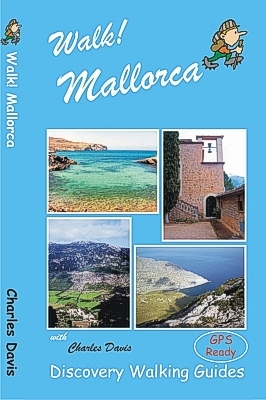 On page 131 of "Walk Mallorca" I should have reminded myself that NB does not mean "Never Bother" since I too went a bit astray, not helped by a strong wind, rain showers and a few alarming claps of thunder. I met two separate small groups of young girls also trying to find the start of the trail down to Deia. One of them took some convincing that it actually existed but I was able to assure her since I had done it twice last year. The other group gave up and said they would return to Valdemossa. The route between Wps 9&10, navigationally speaking, is (in my opinion), the hardest part of trail 49. PS An ex-colleague plus wife, ( I am retired), backpacked the full length of the GR221 last year and found your guide book very useful.